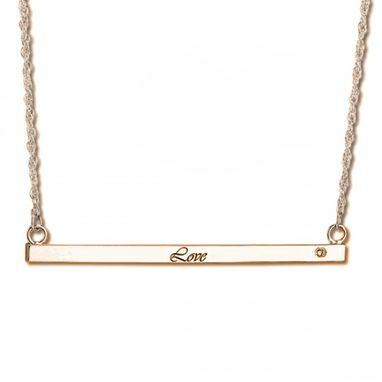 Engrave any name in any cursive typeface in this 14k gold name necklace bar pendant accented with a twinkling, near colorless, round diamond of about 0.05 carats. This bar necklace may be personalized with up to 30 characters. A 14k gold chain comes along with this women's thin bar pendant necklace. All personalized jewelry take about ten days to make & ship. Once purchased, custom jewelry is non-refundable.